As many of you know by now, about two weeks I tweeted a fateful tweet. I promised I would do one (1) push-up for every retweet that tweet got in an effort to aid Bryce Harper in his pursuit to win Major League Baseball’s Face of MLB contest. I thought it might get 15 or 20 retweets at the most. To put it mildly, the tweet took off after the Washington Nationals official Twitter account found it (as I discussed here). While Dodgers ace Clayton Kershaw bested Bryce in the contest, I am a man of my word and all 274 push-ups stared me in the face. I completed them and provided video evidence which can be found here. Nearly 11 minutes seems like a long time, but I must say, it is worth watching. Be sure to check it out! In the days since posting the video Sunday night, I have gotten overwhelming response. I decided to share the responses I received from some, shall we say, well-known personalities. While the video was intended to be fun and entertaining, I also wanted to be sure to finish all the push-ups. When it was all said and done, I thought it would be fun to see if Bryce Harper himself, the point of all these shenanigans, might like to see it. So with the help of a few friends and the power of social media, we repeatedly sent Bryce the link to view the video. After what was probably an annoying amount of mentions, Bryce came through. On Monday night he favorited (the Facebook equivalent of “liking”) one of my tweets with the video link included, thus at least acknowledging my existence. The blue check mark next to a name on Twitter means that the person is verified; that it’s actually them. 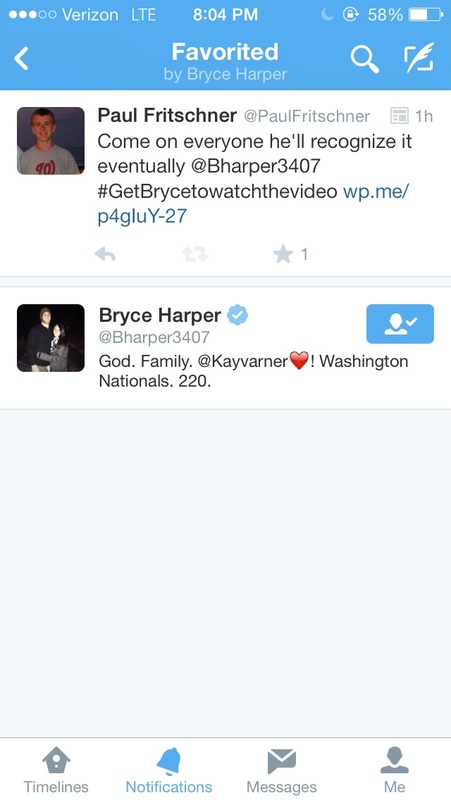 The tweet Bryce Harper favorited. When I saw he had done this, I tweeted to him thanking him for the recognition. He in turn favorited that tweet too. He didn’t respond with any words, just the two favorites. But hey, it’s better than nothing and that is all we asked for. Whether he actually clicked the link and gave the video 10 seconds of his time, I guess we’ll never know. At least there is that possibility. 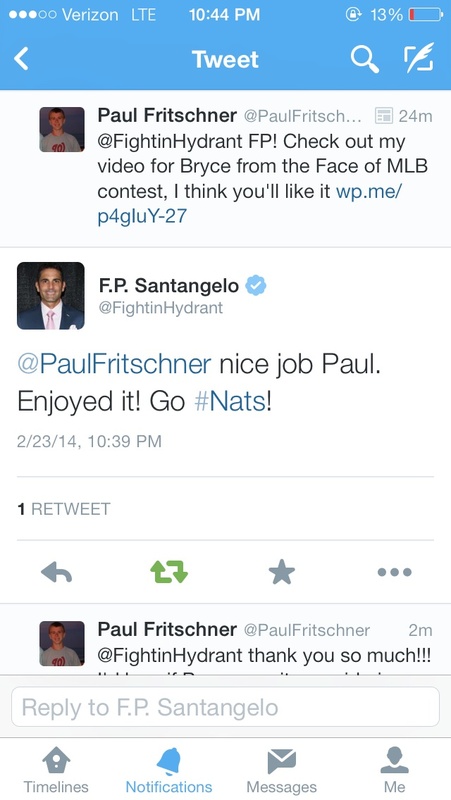 For those of you who watch the Nationals on MASN, you are familiar with the comical color commentator F.P. Santangelo. If you do not watch the games, I’d suggest giving one a try this season and turning on the TV. Maybe you’ll be lucky enough to catch his famous line “There goes the no hitter” when the Nationals get their first hit of the game. Watching the games nearly every night, I love listening to the commentary of F.P. and his partner-in-crime Bob Carpenter (who you might remember I met at NatsFest this year). As an aspiring broadcaster, I take in the off-the-cuff humor and absorb as much information as I can when listening to the games. Not to be biased or anything, but F.P. is far and away my favorite commentator in sports. So when I posted the video, I thought I’d give it a try and send him the link too. Wouldn’t ya know, instead of a favorite, I got an actual response. If F.P. is my favorite sports broadcasting personality, there is no question who my favorite Major League Baseball player is. I have watched Ian Desmond’s career grow as he ascended the ranks from his days at Potomac, to now becoming one of the elite shortstops in the league. He plays the game the right way, with hard work and a lot of heart. I decided to tweet him the link to my video also. However, I didn’t hear back; right away at least. The next day on Monday, it was time to pick our numbers for the high school baseball season. When my number from last year, 12, was picked by a senior, I was a little disappointed but didn’t really care all that much since I didn’t have much affinity for 12. I knew right away what number to pick: 20. I chose it for the sole reason that it is Desmond’s number. That night when I got home, I thought I would let him know, but I did not expect a response. Desmond’s motto is to eat #steak, so I thought I would include that to perhaps catch his eye. It was more of just a fun fan tweet. I did not expect to be pleasantly surprised. As I was trying to believe what I was reading, an observation occurred to me. Notice that nowhere in my tweet did I mention my push-up video. In his response though, he brought it up; meaning that somewhere, either from my tweet the night before or another source, he came across the video. 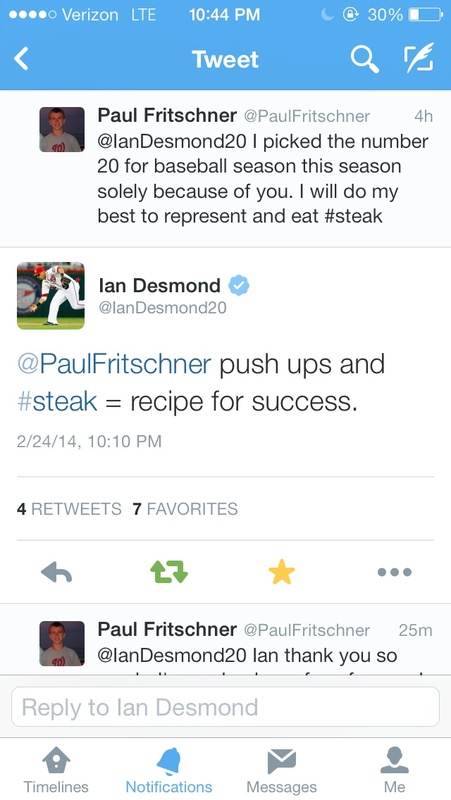 Out of all three responses, this one from Ian Desmond meant the most to me. I honestly had so much fun doing the video. I did not expect the original tweet to take off, or the response to the video to be as big as it has been. Hopefully it provided enjoyment and generated excitement for the upcoming season. Thank you to everyone who has shown support, both to the video and to this site. I hope you all become frequent readers and I will do my part to make this season fun and exciting. As always, you can subscribe to this site via email on the right side of this page. You will not receive any spam or junk emails, just an email when I post. Here’s to what is to come this season! Last week I made a deal with the Twitter universe, in a deal I explained in my last post which can be found here. Basically, I would do one push-up for every retweet I got on a tweet helping Bryce Harper win the Face of MLB contest. Sadly, he lost. However, I am a man of my word and my push-ups loomed. Without further ado, here is the much-anticipated video. I must say, it is worth watching the whole thing. As a disclaimer it is not entirely push-ups. There had to be some excitement, right? Nats fans especially will want to be sure to watch until the very end, where there is a clip which we all remember like it was yesterday. I hope you enjoy! 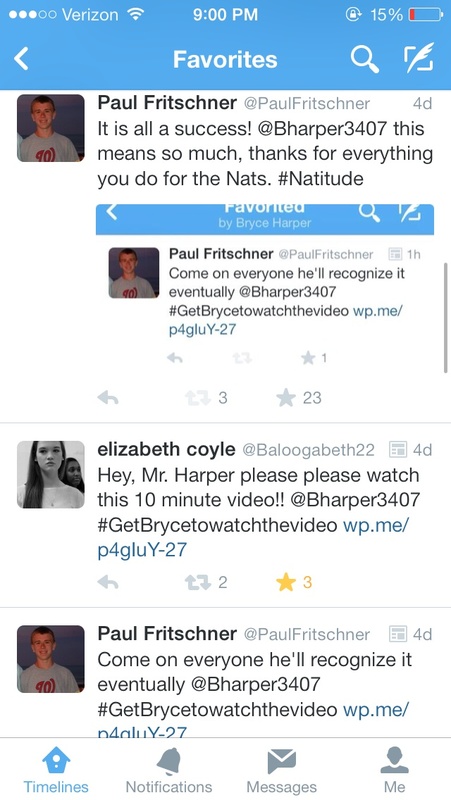 Mr. Harper, if somehow you come across this video, I enjoyed every last push-up. Thank you for everything you do for the Washington Nationals. Go get ’em this year. Over the past few weeks, Major League Baseball has been conducting a “Face of MLB” contest. The bracket can be found by clicking on those words. Basically the way it works is that every weekday, fans take to Twitter to vote for the player they choose using a hashtag for the player’s name and then #FaceofMLB. For example, a tweet may be as simple as this: “#BryceHarper #FaceofMLB” Each tweet with both hastags included count as a vote, and each Twitter account is allowed 25 votes per day. Today it is the Nationals turn to show their Natitude by voting for Bryce Harper. You can vote for him by including #BryceHarper and #FaceofMLB in a tweet. Earlier, I tweeted a simple tweet which I did not think would become very widespread. Boy was I wrong. The Nationals official Twitter account retweeted it, and it took off. As you can see, it has over 200 retweets, including ones from Matt’s Bats and The Nationals Archive. I am a man of my word, and I promise I will do every push-up. As visual proof, I will post a video right here on my site within the coming days so everyone can see. I guess I better start stretching now. Voting for Bryce is open until 8 AM tomorrow morning, so keep those votes coming Nats fans!